1. Bacterial wilt - this makes the stem droop. Stems that are affected will be wet and subject to rot. 2. Bacteriosis – if the stem is brown and soft, this can be the cause. The infection causes pith to blacken and rot with an unpleasant smell. Roots can also be infected. 3. Botrytis blight (grey mould) – this is caused by a fungal infection. Plants may show brown spots which turn into a grey coloured mould. This is be exacerbated by humid conditions. 4. 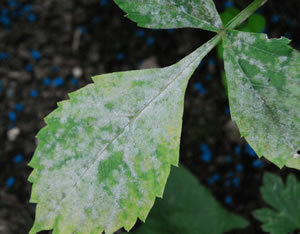 Powdery mildew - white or grey powdery mould appears later on in the season causing infected leaves to become distorted and drop. 5. Stem rot – a white mould will appear at the point where the stem enters the soil. It is worse in wet conditions and causes the plant to wilt and die. 6. Verticulum wilt – brown or black streaks appear on the stem. This is a fatal condition and plants, including tubers, must be destroyed. 7. Canker – bacteria enters damaged stems and kills them. This common infection is also known as ‘fire blight’. 8. Crown gall – also caused by bacteria and causes abnormal growths at the base of the stem. It affects growth and the entire plant must be destroyed. 9. Viruses – these can cause a variety of symptoms including mottling of leaves, distorted leaves, ring spots, wilting, streaks on stems and stunted growth. Pesticides cannot treat viruses but controlling insects, especially thunder flies (thrips) can help to keep the plants virus-free.